Quality Engineered Flooring CAN be Refinished and Sanded | Nor-Cal Floor Design, Inc. The biggest misconception about engineered wood flooring is that it can not be sanded and refinished, as can be done to a solid floor. A quality engineered wood flooring product, such as ours, can be sanded and refinished just like a solid floor. The wear layer determines the amount of sanding that can be done. An engineered floor can have the same thickness wear layer as a solid floor has. On a solid floor, the wear layer is the height above the tongue & groove. On a high-quality engineered wood floor, the wear layer can be of similar thickness. This gives quality engineered flooring the same ability to be sanded and refinished. In the illustration, you can see the solid flooring wear layer is 1/4”, and the engineered flooring wear layer is 3/16”. This is prior to installation. A solid floor gets sanded and finished at the time of installation, leaving the wear layer with a similar 3/16” for future sanding and refinishing. 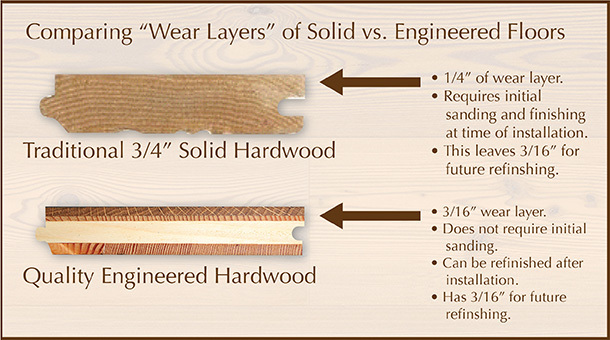 A engineered floor can be finished before or after installation and does not require sanding at the time of initial finishing, leaving the same 3/16” for future sanding and refinishing.